Sweet Lady Chrystel herself ! Well, I happen to be French, of Scottish (Reid, MacKinnon) Irish and Breton ancestry. My father used to dress me up in a kilt on Saint Patrick's Day and send me off to school thus attired, I hated it. Later I became a piper, I have been a professional piper since 1987. Then I met Chrystel, a sweet lass that became my wife. She was a professional seamstress. As such she began to do some research on the historical origins of the kilt. She was quickly enthralled by all of the different aspects that this research uncovered. And guess what? She started making me kilts! Plenty of them! My friends were so envious! 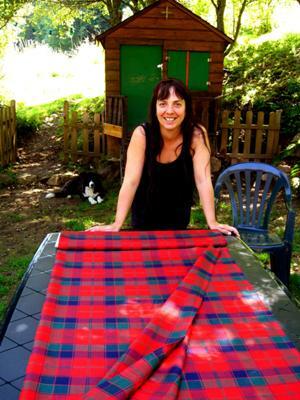 This little French seamstress set the Double Box Pleated Kilt as a standard across the world and is now accepted as an authority, a true kilt maker. Needless to say I'm mighty proud of her. Is there a distinctive pattern that is recognized as a Breton tartan? Do you have any pictures you could post? I teach French to 10-12 year old children and I did a unit on the Celts in France around St. Patrick's Day. They were amazed to learn that there were Celts in France and in Spain. The children loved the music videos I showed them of Tri Yann (still going strong today!) and of Nolwenn Leroy singing La Jument de Michao, Tri Martolod in Breton gaelic and Mna Na Heireann in Irish gaelic. Breton Tartans are now very popular as they are all over the world ! Brittany has a very distinctive traditional dress style of its own. However, I have never seen Breton men in kilts. Are kilts part of traditional Breton dress? I always thought that kilts originated in Scotland. [Does she make them only for you or does she sell them as well ? For every man of good will all over the planet ! Fortunate man ? for sure me lad ! I think we met on another site ... X marks the Scot. If I remember well, you live in Savoie. Does she make them only for you or does she sell them as well ?